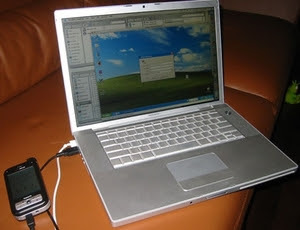 So you are out on the road and you need to access the internet with your notebook pc. You cannot find a wireless access point within range from where you are staying, but your windows mobile device (cell phone) has good signal. Depending on your carrier and the build of Windows Mobile 5.0 on your portable device, you may be in luck. Connect your windows mobile cell phone to your notebook pc with the USB cable that came with the phone. Look for an icon that is labelled Modem Link or Internet Sharing (depending on your carrier) and click on it. (If your phone doesn't show an icon for Modem Link or Internet Sharing, you'll need to look into an application for your phone called pdanet). at the bottom of the window click either Connect or Activate (which ever is shown). On the notebook pc, you should see a device found notification balloon and then internet sharing device connected. You will then see on the phone where is shows Status - it will show Connected. You will now be able to navigate the internet on your notebook. When you are done using the connection, be sure to select disconnect (or deactivate) on the phone as tethering can interrupt activesync downloading email to your phone. Check with your carrier for any charges they will apply for tethering before using. I hear that users with Tmobile service that have data service do not incur and extra charge for tethering and Verizon users are supposed to be able to use tethering without additional charges if they have the Data Unlimited plan. But again check with the provider first! Now quit worrying about using your notebook on the internet and go ride your motorcycle. I'm a Verizon customer and they charge $10 extra to tether a Crackberry even with the unlimited data plan. Thanks for this! I had internet through the cell before but cancelled cause it was too expensive...like $60 a month. I will check into this. I have been going to Starbucks & Barnes & Noble to use internet. They aren't always around. I never even thought of that idea. Thanks!